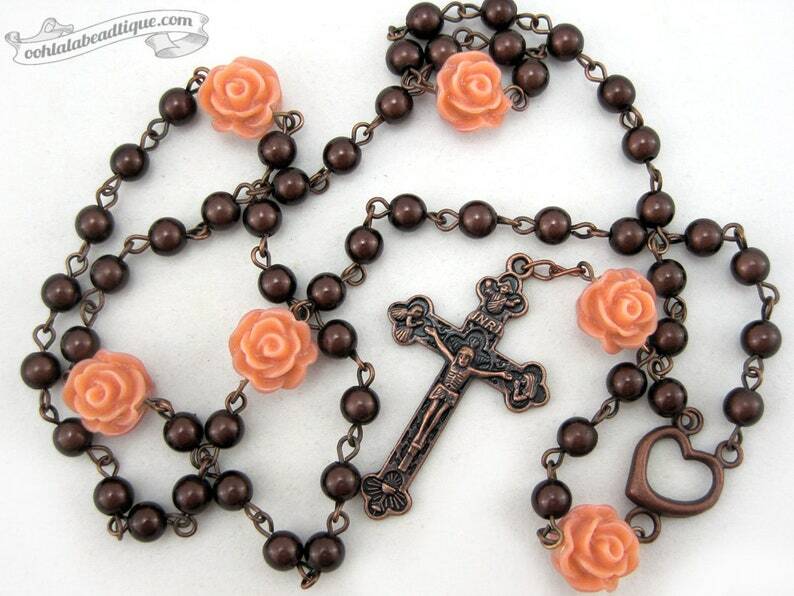 Pray for hope on every easy-to-hold miracle beads that make up the length of this Brown rose rosary necklace. 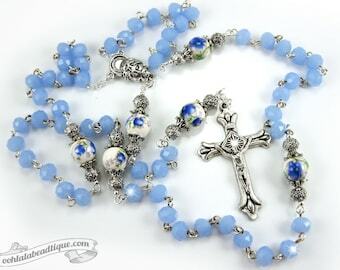 The handmade unique Rosary is inspired from the traditional Catholic Five decade Rosary Design. "Hail Mary" brown Japanese beads are paired with large "Our Father" peach color lucite rose shape beads creating a piece that is classic, yet trendy. Finished off with copper heart centerpiece, and a copper Holy Trinity Budded Crucifix. The rosary is hand wire wrapped with copper plated wire for strength, durability and drape. 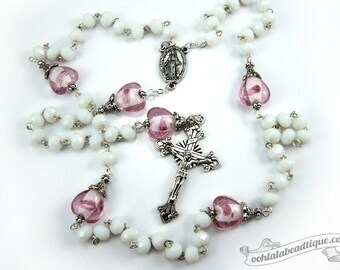 The necklace part of the Brown rose rosary necklace is approximately 25 inches long. The pendant drop from the centerpiece to the crucifix bottom is 5.5 inches long. The copper Holy Trinity Budded Crucifix is approximately 1.75 inches long including the bail. Holy Trinity Budded Crucifix has three buds or circles on each arm represent the Holy Trinity. On the right and left sides of the front of the crucifix are the effigies of the Virgin Mary and an angel in prayer. Behind the head of Christ is Dove representation of the Holy Ghost. Above his head is the sign with the word "INRI" and above that is the Resurrection of Jesus. At the bottom of the crucifix is the Eucharistic Symbol. On the back of the crucifix are the Words: Tertium Millennium, The Greek Letters Alpha ~ Omega and "Italy" Alpha and Omega are Greek letters symbolizing the eternity of God at the beginning (alpha) and in the end (omega) of all things in Christian tradition. Tertium Millennium means "Third Millenium". Brown color symbolizes the earth, humility and is closely associated with monastic life. What are miracle beads? Miracle beads contain a lucite core and are finished in a mirrored silver plate which is then coated in multiple layers of color lacquer. When light passes through the layers of lacquer and is reflected off the mirror-like plating, they create an illusion of depth. They actually seem to glow! Some describe it as looking like a bead within a bead. Your Brown rose rosary necklace will be packaged in a decorative dust bag. It will then be shipped to you in a padded mailing envelope. Package will include "How to Pray the Rosary" Card. Please have your rosary blessed by your local priest. The actual colors of the Brown rose rosary necklace that you will receive may vary from the one you see on your monitor. All monitors and computer screens are calibrated differently. The same product may appear in diverse colors on different monitors.